I've spent a lot of time in Astoria/LIC recently. I got engrossed in the Frederick Wiseman retrospective at the Museum of the Moving Image, and saw several of his New York documentaries. I also attended the Wiseman interview there last week, which included clips from his upcoming Jackson Heights movie, opening at Film Forum next week. In a typically trivial way, I was enormously pleased to be right behind Wiseman in a coffee line, before the evening's event began. Right now I'm cat-sitting in Astoria for family members off to Warsaw, Berlin & London (lucky them). It's good to be in Queens though, and somehow all the Wiseman-watching just crystallizes the pleasures of walking here. Even a few blocks of Broadway offer up a buzz of energy. How beautiful the mix of age, language, race, class. How beautiful the absence of airs. Sure, the architecture of the street, between 31st and 21st, is nothing remarkable - a mixture of solid twenties or thirties architecture broken by ugly-as-hell Fedders-embossed newcomers. But it's people that make the city. Sometimes I like to stop at Bakeway, grab a pistachio cake and coffee, and sit on a bench out front and watch the proverbial world walk by. Today, instead, a booth at the Bel-Aire, with a Russian waitress on top of her game. The C-Town on Broadway is coming down, and King of Falafel (Yeaaah Baby!!!) decamped to 31st. I didn't go to C-Town much, but sometimes popped in for a few things when visiting the kids. It was good for its hot dishes. In the golden, late afternoon light of fall, even a half-demolished grocery store acquires resonance. The shutters are down at JuiceLand, and a closure sign from the Dept. of Health is up on the door. Workers still lingered inside, but it looks like customers will need to get their next drink fix elsewhere. Austin- based JuiceLand opened a year ago on 9th Street, replacing a We Buy Gold business (Need Cash? Cash Now) and appears to have been popular with the smoothie crowd. As I looked inside, the woman next to me, talking on her phone, was distraught (OMG) about the closure. In September I noticed a House for Sale by Owner sign at 147 11th Street, which had sold earlier in the month for $999,000 - down from a 2014 asking price of $2,250,000. The new owner is looking for a quick flip. Fire-damaged 147 is back on the market for $1,650,000. 336 22nd Street has just gone on the market for $1,695,000. It's covered up front with brickface veneer. Its porch is gone, but it looks like a cornice is lurking there underneath the siding. As you can see, back in the 80s it still had some of its old looks. I hope it gets to stick around. It's a bit of a disadvantage to be selling thoughtfully crafted two-bedroom condos ($1,410,500 - $1,785,500) when you've got this on the front door. RE:BORO COMMISIONER HAS ISSUED A 15 DAY LETTER OF INTENT OF REVOKE APP/PERMIT 320576523 ON 10/9/2015. CONTRACTOR REGISTRATION REVOKED. Still, I guess it will all get sorted out sooner or later, & then - the high life! Live in one of the most sought-after neighborhoods in the entire city. All of the world-class eateries, nightlife spots, shopping outposts and cafes that have made South Slope so revered are located within a short stroll. Dine at Applewood, Bar Toto, or Fonda. Have a cocktail or a craft beer at Barbes and the Black Horse Pub. 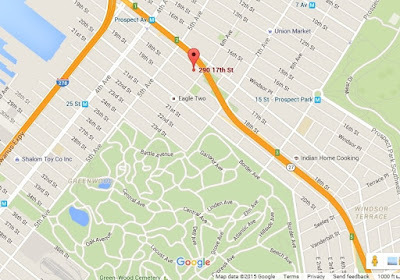 Start your weekend off right with a jog or a bike through Prospect Park, just four blocks away; then, have a perfect cup of joe at Grumpys and brunch at Talde. Among them is Travis Wiggins, 28, who's been a butcher at Pathmark for eight years. Now he's hoping to make money as an Uber driver. Wiggins has an 11-month-old son and his wife isn't working because she's in school to become a community health worker, he said. "My son is going to be one next month and I'll be out of a job," Wiggins said. "I've got bills to pay and a mortgage to pay." The goal of Williamsburg’s new Museum of Food and Drink — the first of its kind in New York — is to exist at the “intersection of important and awesome,” Executive Director Peter Kim told the crowd at the museum’s official opening and ribbon-cutting on Wednesday morning. There's a notice on the shutters of Franchezka Unisex, the salon that belonged to the late Francisca Figueroa. 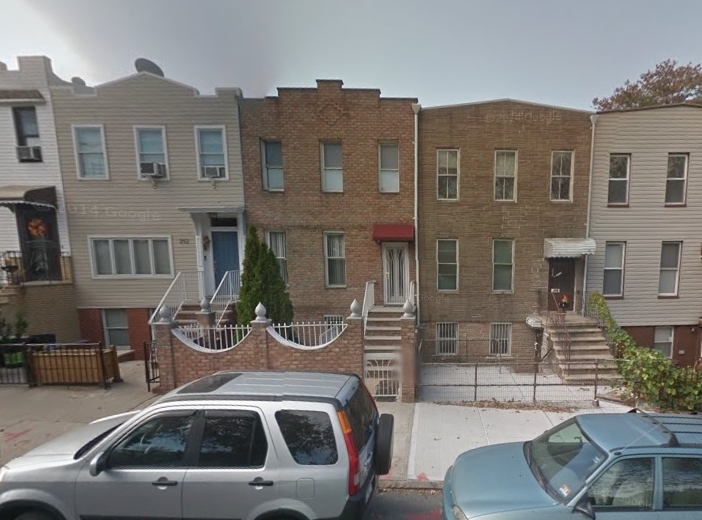 Figueroa died earlier this month in a Borough Park gas explosion. The cause of the explosion has still not been determined. Bring your family and friends to help raise money to reopen the salon of the famous Francisca Figueroa. Her children have put together this event to keep their mother's hard work alive while she is watching in Heaven. So come and have some fun playing games, kids face painting, socializing and delicious food. "The trajectories and traces of Harvest Dome 2.0 amount to a poetics of shared aspirations for the natural environment within the city. The challenge is to embrace the larger-than-life spaces of nature permeating our city without sizing them down for easy consumption. Harvest Dome brings people together in spaces and places seemingly inaccessible for their contamination, marginalization and neglect, to confront the sublime of nature and its transcendence in the urban realm, amid ongoing efforts to improve the quality, access and enjoyment of this resurgent public space." That sounds very serious indeed. 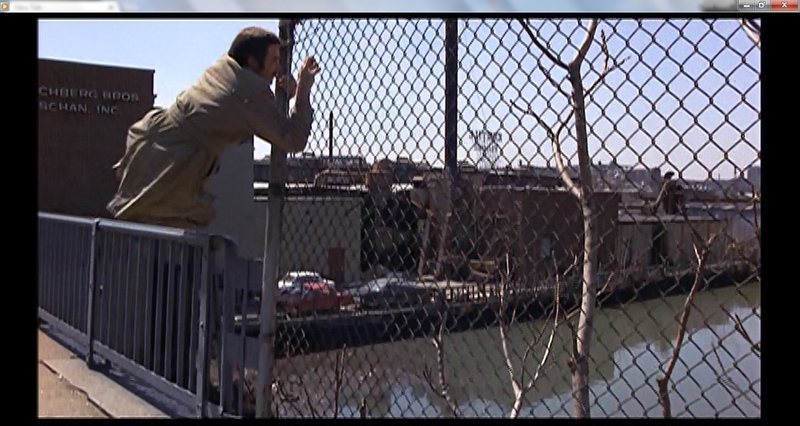 I wonder what Burt/Shamus - intrepid Gowanus man of action! - would make of such earnest sentiments. But enough, enough of Burt. Looking at the poor old dome today, just what is that boat-shaped structure next to the umbrella frames and soda bottles? I'd love to know. GOWANUS — The long-awaited cleanup of the Gowanus Canal could be delayed by at least a year and a half if the city doesn't follow the U.S. Environmental Protection Agency's recommendation to dig up a public pool and install a sewage tank underneath, EPA officials charged Monday. The delay could be avoided if the city agrees to build the tank at the "Double D" pool and Thomas Greene Park, EPA Region 2 Superfund Director Walter Mugdan told Community Board 6 members. More than 300 members of Brooklyn’s glittery literati packed into the>recently-restored Park Slope library branch for the award ceremony and fund-raising party. A bar behind the usual information desk dispensed drinks with literary names, including “The Dorothy Parker,” made with New York Distilling Company’s Dorothy Parker gin, and “The Carnegie,” a vodka and cider concoction named for the patron of the library system. Another bar in the juvenile fiction area passed out beer and wine just steps from shelves filled with titles like “The Galactic Hot Dog” and “Ninja Librarians,” which attendees said offered a particularly cheeky thrill. 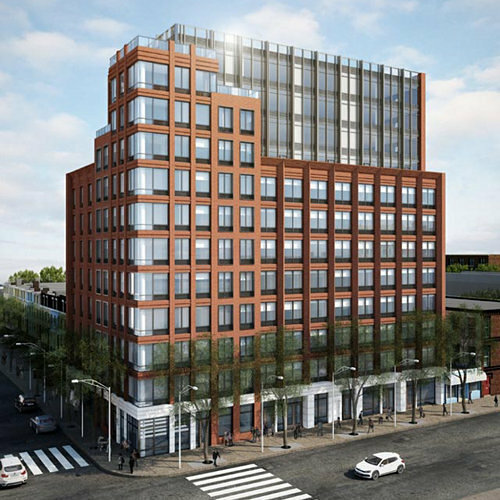 Right after news of Surfish coming to Third & 14th, signs of another commercial rental likely to go nouveau-Gowanus. Mixed-use 545 Third, across from Surfish, is on the market for just over three million dollars. It's a beautiful looking building. According to property records, the storefront church, Iglesias de Dios Pentacostal M.I., Roca de Suguridad has owned the building since the mid-70s, and although 545 appears to have been seized by the city in the eighties, a more recent deed seems to show it still belonging to the church. These sorts of transactions are unclear to the amateur records reader. The two-apartment/two-retail-space property will be delivered vacant, and we hardly expect to see a storefront church at this address again. This will leave Jesus Never Fails Church of God (9th) as the only storefront church nearby on Third. We hope its name bodes well for its future, though changing demographics make us wonder. There were flags atop the 470 Fourth construction site today, and cheering could be heard. It's hard to compare the unfinished building (Adam America/Slate/Naveh Schuster) with the rendering (bottom picture), but it looks like it's topping out. Way down below, next-door beauty salon, Imagen Unisex, soldiers bravely on. Work has been going on at 700A Fifth since the spring, and signs for incoming Caribbean restaurant Marleey's have been up since August. But no opening. I stopped by yesterday and learned that the owners hope to be opening their doors at the start of next month. I'm told that the food will reflect the roots of the three chefs at work in the kitchen: Guyanese, Trinidadian & Jamaican. Sounds great - please, please, any chance of doubles? As I've said before, I hope the prices are reasonable, and that they can co-exist with other, competing businesses, like the Breadfruit Cafe, Rooster's & the food truck on Fifth. Sure, it's not like eating from the wide & fabulous variety of West Indian street food in say, Flatbush or Crown Heights, or Guyanese in Jamaica (the Queens location), but the food close to home is good, filling, and fairly priced. At Breadfruit the other day I got a large plate of delicious stew chicken & curried goat (cabbage, rice & peas) that would easily have fed two, for $13, and the three dishes for $23 deal that two of us ate Rooster's recently was a huge amount of food. Both places look like they could do with more support, and Breadfruit, plagued by scaffolding & clouds of dust from building renovation, has been keeping erratic hours. Show some love. 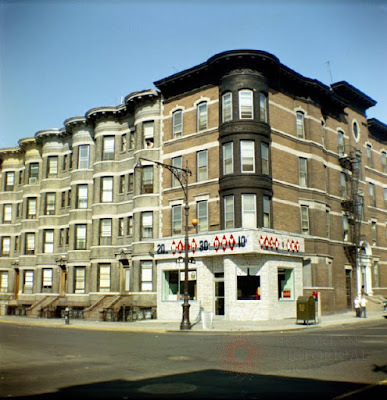 If the work of photographer Percy Loomis Sperr is a vital resource for images of Brooklyn streets in the 30s and early 40s, it's John D. Morrell who illuminates Brooklyn in the 50s and 60s. 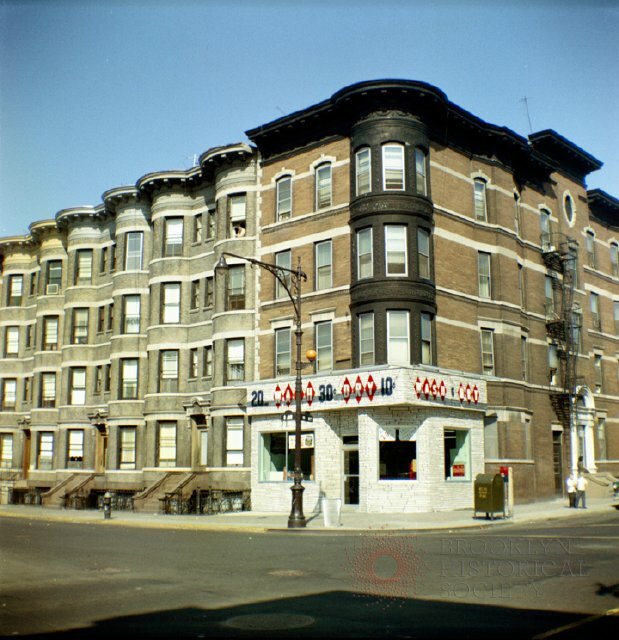 Some of his work is in black and white, but my favorites are his chromogenic color prints, casting the borough in pale but luminous postcard colors. Morrell (1921-1988) was Assistant Librarian at the Long Island Historical Society (now the Brooklyn Historical Society) and donated over two thousand photographs to the Society. I've come across his photos many times before, but am now systematically looking through the whole collection. I was happy to find this one, of the laundromat at Eighth Avenue & 13th Street. It was taken in 1961. I've taken many pictures of this place myself, and have watched its old signs fade and crumble over the decades, but in Morrell's shot we see the laundromat in pristine condition - faux-brick exterior bright & clean, the letters on the sign a vibrant red, and the bright blue 10, 20, 30 cents all present and correct. 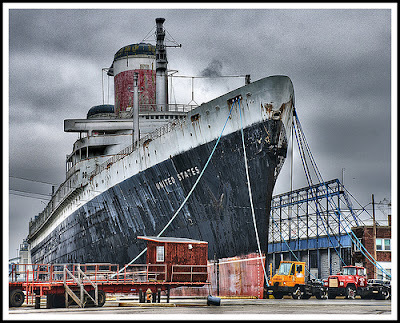 In 1961 there was no awning above the avenue side window. If you're like me, you'll have a soft spot for buildings and signs that eschew cosmetic intervention. I like the touch of time. Still, this one's lovely to see. along with a few more pictures thrown in. You can't have too many of this corner. Incidentally, South Slope News reported last month that the Lucky Laundry is up for rent, and will not be replaced by a similar business. Enjoy it while you can. 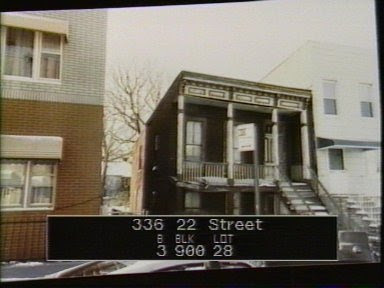 ... the objections to the sales of Pathmark stores #624 & #642 had to be withdrawn when it was finally established that the buyers (the Manichevitz family) were a real estate entity and have no desire to operate a supermarket in either of these two locations. Our global protections from the 2011 bankruptcy settlement only protect our stores from being sold to non-union supermarket operators, not real estate entities. Unfortunately for our members it means that the fight to keep these two locations open and operating as Union supermarkets has officially ended. But the owner of the shopping center where the Gowanus Pathmark is located wants to keep a supermarket at the site and recently filed an objection in bankruptcy court asking Judge Robert D. Drain to allow the second-highest bidder, grocery chain ShopRite, take over, according to court documents. City Councilman Brad Lander also wrote to the judge on Oct. 15, lending support to the shopping center owner. "I am eager to preserve this space as a supermarket, as it is a vital asset to many members of our community," Lander said in a letter to Drain. "We're hanging on a string here," Machado said. "It's a sad thing — I'm 40 years with them." From yesterday's Gothamist, another story on Sunset Park gentrification. Sunset Park residents concerned about Industry City turning their community into"the next hot neighborhood" may have to brace themselves for a pumpkin spiced explosion:a giant Starbucks "destination" Roastery could be on the way. On Sunday, Tony Giordano, an administrator of the Sunset Parker Facebook group, posted a blistering critique of Industry City's management and those part of"Gentrification Inc."who would develop the area without considering its current residents. User Dana Dobrzynski whose LinkedIn profile lists her current position as a Starbucks store manager, chimes in about a "Roastery coming to Industry City" from "Seattle" that would employ 300 people. In conversation with Tony Giordano and other Sunset Parkers, who are rightly sceptical about the number of "real jobs" Jamestown & partners will ever bring to local residents, Ms Dobrzynski finally reveals her true colors. "Wow. You people are really out of control and angry residents. And I won't stoop to your level. I'm happy for the gentrification and will be happier when it moves these "angry old-timers" out." She finally said it. But old-timers are angry, and with justification. 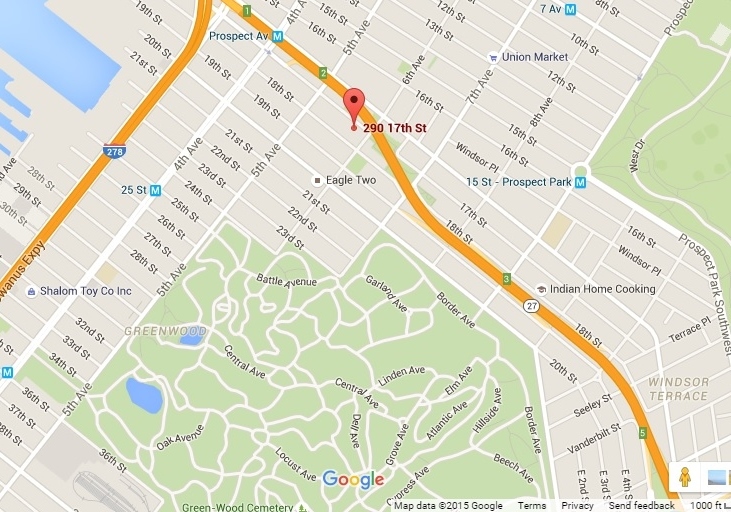 Look at the soaring price of real-estate in Sunset Park in the last few years. Look at the rapid investor-acquisition of multi-families,and the push to "convert" rent-stabilized apartments & small business spaces to high-rent market rates. Look at the new Industry City-heavy selling of the neighborhood. In my, by now, heavily developed area, close-by, there's still some of the same story. A long-time neighbor on the next block over heard herself recently referred to as a "leftover." Tenants in a building on my block are fighting against their nefarious Adam America landlord's illegal practices. And just the other week, right on our doorstep, realtors told prospective buyers that we - adjacent long-time residents - should be "grateful" to get a looming condo building next door. Grateful ??? The anger is not going away any time soon. "And here's the good news - he's got a trust fund! ... But, like, he DJs and stuff, he's still cool. He's still, like, rough around the edges..."
This sounds like bad, bad news for employees of the two stores, one in Borough Park, and one at 1 - 37 12th Street, I hope we'll get more news soon. As part of the bigger picture, I wonder how this will affect neighboring businesses, a couple of which already have business space available for lease. And what will happen to the giant parking spot across from the supermarket? Update: I visited the Gowanus store today and spoke to a couple of employees. They remain convinced that despite news to the contrary, another grocery chain will ultimately take over from Pathmark. Let's hope they're right.